This is a public notice to drinkers of Baristador Coffee as well as a story about how coffee can help create bonding moments between friends and family. I’m writing to explain that some labels might look a little bit wonky and some bags might even have an extra, random label. This is due to me asking my 6yo daughter, AJ, for help applying some labels to some Baristador Coffee bags. To my surprise, she said yes, and was ready for action. I do have a confession though. She said yes, raced off to the playroom and returned with her sheets of fancy, little stickers of hearts, Santa, and presents. I chose the word ‘sticker’ on purpose because she loves playing with them, so having played up the ‘fun’ version of the word I figured it would only be fair to compromise. So, instead of telling her no fun stickers on the coffee, I asked if she would like to put little, happy stickers on some random coffee bags after we’d put all the ‘big’ stickers on. Some of you might notice some crinkles in the rear labels as you order coffee and espresso supplies for the Christmas and summer breaks. Mostly they are fine, but some have ridges and some are on an unexpected angle. There are also about 50 bags with little kids’ stickers on the rear, too. One thing that struck me as we were efficiently working together; our focus on a task meant my 6yo was less shy and more open to sharing ideas and asking questions. In fact, she announced that she could estimate the number of labels needed for the fast-diminishing piles of bags. 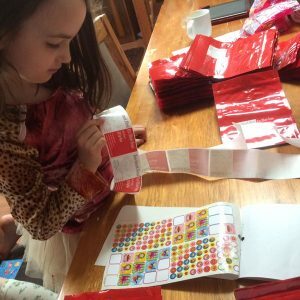 She also did experiments comparing speed and accuracy to work out the best pace for moving quickly without messing up the stickers through haste. It was a great dad and daughter bonding exercise and it’s yet another way that this humble beverage of coffee laid the foundation for a relaxed chat and friendship building. So please drink up, order lots of coffee, so we have another excuse for a coffee bag labelling day! PS It’s not the first time AJ has helped her dad and you espresso aficionados. Look at this story from when she was 3: How many cups of coffee in bag of Baristador Coffee? This is awesome. If I ordered some coffee from you (which I might), I would be honored to get a bag of coffee that was labeled (stickered) up from your daughter. Being the father of a 6yo boy has and is still an adventure. Hi Greg, my apologies for the delay in responding. Ironically, my daughters do ‘soak’ a lot of time in a good way 🙂 If you do get an order in for this group roasting I will make sure you get a daddy/daughter stickered bag or two. There is a comments field in the checkout, wouldn’t be a back idea to pop a note there to prompt me! Yours in the spirit of espresso, Steve. Oh this is so cool, I received a cool princess sticker on mine, how your daughter knew I was a princess? I loved it! I am also benchmarking this and expect another surprise on my next order! !